Miami Marlins fans will recognize these words as the greeting that Dave Van Horne has used before every game since he began broadcasting major-league games in 1969 with the Montreal Expos. These words are also an invitation to sit down and listen to the smooth baritone of a Hall of Fame-recognized broadcaster who spent 32 years with the Expos before moving on to the Marlins. Dave Van Horne was born in Easton, Pennsylvania, on August 25, 1939, the first of two boys born to Roland and Evelyn Van Horne (brother Allan was born in 1945). Roland was an accountant who moved to Pennsylvania from Boston. Evelyn was from Brattleboro, Vermont. Dave had a typical postwar childhood, playing sports and collecting baseball cards, some of which were used to motorize his bicycles. He also enjoyed listening to baseball. Van Horne graduated from Wilson Borough High School in Easton in 1957, and like many young people, he had no idea what he wanted to do with his life. He was in the Naval Reserve and had considered going on to active duty, but his parents talked him out of it. He was interested in drama, having been part of his high-school drama club, and that led him to enter the drama department at the Richmond Professional Institute or RPI (now known as Virginia Commonwealth University). Tagging along with his friends proved to be a smart decision because it led, indirectly, to the beginning of his broadcasting career. During his sophomore year, someone put up a notice on his dormitory bulletin board from local radio station WLLY, which was auditioning male students for a weekly Top 40 radio show. Some of Dave’s friends were going and invited him along. What started out as a lark led to a career of 50-plus years. Dave did the radio show for most of his sophomore year, and when the general manager left to start a new Top 40 station in Roanoke, he invited Dave to go along with him. To the dismay of his parents, Van Horne dropped out of university and began his full-time radio career in Roanoke at station WHYE. From there he moved to WBDJ in Roanoke and it was here that he got his first opportunity to do sports. The station broadcast high-school football, and the previous season’s announcer was fired a few days before the season started. The station general manager went around to all the staff announcers asking if they wanted to do the broadcast. Van Horne said he had never broadcast a football game before but was willing to give it a try. For the next few years, Van Horne broadcast football and basketball. He developed a solid reputation, which led to his big break as a baseball broadcaster. Frank Messer, the play-by-play voice of the Triple-A Richmond Virginians of the International League was moving on to the Baltimore Orioles. Van Horne’s reputation led to his getting the job as Messer’s replacement, working along Richmond broadcast legend Frank Soden. Well, sort of, but not really, because when Van Horne arrived in Richmond to broadcast baseball in 1965, there was no team in the city. The Virginians had been sold and were moved to Toledo to become the Mud Hens. But the Milwaukee Braves were moving to Atlanta for the 1966 season and their International League affiliate, the Atlanta Crackers, were being relocated to Richmond. Dave got to spend the 1965 baseball season sitting under a tree, because while he had other duties at the station, the general manager wanted him to go to Byrd Park in Richmond, watch American Legion games, and practice broadcasting the games into a tape recorder. Van Horne finally took his seat in the Richmond Braves’ broadcast booth when they began play in 1966. Soden advised him to listen to other baseball broadcasters. He chose to listen to some of the best, including Chuck Thompson and Frank Messer in Baltimore, and Phil Rizzuto, Bill White, and Jerry Coleman with the New York Yankees. Dave honed his craft from 1966 to 1968 in Richmond. One of the techniques he used is no longer available to today’s young broadcasters: the wire re-creation. Soden, Van Horne, and a third team member, Ken Tanner, would sit across from each other in a studio when broadcasting a Braves road game. Unlike the old days, when a sound-effects man would roll out various contraptions to create stadium noises, a producer sat in a booth with different sound-effects tapes and re-create the ballgame ambience. A loud, noisy Western Union ticker sat in another studio and spewed out the game details that the broadcasters used to describe the game. The word “details” may be exaggerating, because the tape would say things like, “B1” or “S1,”, or “Fly ball, CF.” There wasn’t much to go on. With complicated plays, such as rundowns, they had to call the ballpark to find out what happened so they could describe the situation properly. During his third season, the major leagues were expanding, and Atlanta general manager John McHale was moving to Montreal to become president of the fledgling Expos. The story of how Van Horne got the job as English-language broadcaster goes something like this. One day in early 1969, McHale and other Expos executives were driving back to Montreal’s Windsor Hotel after visiting the construction site of what became Jarry Park, the Expos’ first home ballpark. When the subject of an English-language broadcaster came up, director of broadcasting Ray Blomquist told McHale that he had more than 300 tapes and résumés to choose from. A team president trying to get a franchise off the ground did not have the time to review 300 possibilities, so McHale asked Blomquist to narrow the choices down to ten, at which point they would sit down and make a choice. Former Richmond general manager Lou Martin, who was overseeing the ballpark construction from the team’s perspective, was also in the car, and got into the conversation. Blomquist told Van Horne to meet with McHale in West Palm Beach, Florida, where the Expos held their spring training that first year. After a 45-minute interview, Dave got a noncommittal “We’ll get back to you,” after which Van Horne heard nothing. This uncertainty created a problem because Van Horne was scheduled to broadcast the Southern Conference basketball tournament, and his boss needed to know if he would be in the broadcast booth. Once he got off the elevator from Cloud Nine, Dave’s first order of business was to go to a map and find out where Montreal was. He had been to the city as a youngster but didn’t remember it. He also had to learn about the city that was to become his new home, and for that he turned to the man who became his first broadcast partner, Russ Taylor. Taylor was a born-and-bred Montrealer who had been sports director at CFCF-TV before joining the Expos. They first met by phone and Russ told Dave that Montreal had a long-established baseball history and that the city had good, knowledgeable baseball fans. Taylor also educated Van Horne about Montreal’s unique culture and politics, and taught him how Canada’s regions differ from one another. That made his transition to going on the air seamless. As for how he was going to approach the broadcasts, “I used the same advice that many coaches give players: Do what you got here. Don’t try to be something that you’re not,” Van Horne said. Just as players feel an extra twinge of excitement and an adrenaline rush on Opening Day, so too do broadcasters, especially when it’s your first game in “The Show.” Van Horne was no different as he took his seat behind the microphone for the Expos’ first game, against the New York Mets at Shea Stadium on April 8, 1969, which the Expos won 11-10. Of course, three other expansion teams, the San Diego Padres, the Seattle Pilots, and the Kansas City Royals, also played their first game that day, and while these cities were enjoying the thrill of having a new team, it dawned on Van Horne that in one case it wasn’t just a city that was flush with the excitement of a new team, but an entire country. As the Canadian anthem was being played he looked over at Taylor and saw tears streaming down his cheeks. The bigness of the deal resulted, according to Van Horne, in a less-than-stellar performance. Dave was nervous, and he tried to do the game as he did any other, which he felt was a mistake because that approach didn’t allow him to treat the broadcast as the historic event that it was. Like any good rookie, though, the Opening Day jitters disappeared and Van Horne became part of the love affair that Montreal began with its new ballclub. The team wasn’t very good, as its 52-110 record in 1969 will attest, but that didn’t prevent Dave from witnessing some amazing events. For example, he set a major-league record by broadcasting a no-hitter earlier from the start of a career than any other team voice in history, when the Expos’ Bill Stoneman no-hit the Philadelphia Phillies 7-0 in just the franchise’s ninth game. That was a big thrill for Van Horne because it happened at Connie Mack Stadium, where he had spent a lot of time as a youngster when it was called Shibe Park. Surprising milestones aside, Van Horne still had to broadcast an expansion team that lost an awful lot more often than it won, and never went beyond mediocre in its first ten years of existence. Whether the teams were good, bad, or indifferent, Van Horne was never critical of the players he described. Former Brooklyn Dodger and Montreal Royal Duke Snider became Van Horne’s partner in the mid-1970s, first on television, then on radio. While it probably would not be accepted in Scrabble, the word “DaveandDuke” became a noun Expos fans used as a synonym for what they felt was the best broadcasting tandem in the majors, especially in 1979 and the early 1980s when the Expos became a powerful team. Van Horne had other good partners through the years, including Jerry Trupiano, who went on to broadcast the Red Sox; Ken Singleton, now the television voice of the Yankees; and Hutton. During his years with the Expos, Van Horne got to broadcast many historic moments including Willie Mays’ 3,000th hit; Pete Rose’s 4,000th hit; and no-hitters by Stoneman (he pitched his second no-hitter in 1972) and Charlie Lea (1980), as well as a perfect game in 1991 by Dennis “El Presidente” Martinez (where he shouted, “El Presidente, El Perfecto” after the final out). The years following the 1994 baseball strike were lean ones for the Expos as the franchise’s destruction began. After Jeffrey Loria bought the team in 1999, he couldn’t sell the broadcast rights for the 2000 season at a rate he deemed sufficient. When the season started, Van Horne wasn’t on the air. After the first two weeks of the campaign, management decided to have Van Horne broadcast the games on the Internet. He did road games by himself, and broadcast all nine innings both on the road and at home for the season. A month or so into the season, team executive vice president David Samson told Dave that although he was still under contract for the remainder of the year, he had permission to look for a broadcasting job with another team. Van Horne stared calling around and was getting sympathy and not much else until one day when the Marlins came to Montreal. Prior to a night game, former partner Hutton, by this time broadcasting for the Marlins on television, asked Dave to join him and Marlins radio voice Dave O’Brien for a drink after the game. Van Horne thought they were just being nice and feeling sorry for him. That turned out not to be the case, as they told him that the contract of play-by-play man Joe Angel was not being renewed. They suggested he speak to Marlins general manager Dave Dombrowski, who was once the Expos’ GM and therefore very familiar with Van Horne’s work. Not wasting any time, Van Horne approached Dombrowski on the field before the next night’s game and expressed his interest in the Marlins broadcasting position. Dombrowski was delighted that Van Horne wanted the job, and when the 2001 season began, the Marlins had a new but experienced man behind the mike. After his first year with Florida, Van Horne had deja-vu-all-over-again when team owner John Henry sold the club to Jeffrey Loria, who had sold the Expos to Major League Baseball. Samson had gone to Florida with Loria and wasted little time in telling Van Horne where he stood. “David called me soon after the announcement (of the transaction) was made and said ‘We’re so happy that you’re there. You’re not going anywhere. You’re our guy,’” Van Horne said. The move to the Marlins worked out exceptionally well for Dave. He had been a South Florida resident since 1982 anyway, having decided that Montreal winters were no longer fun. He also got to do something he was never able to do with the Expos – be the home-team broadcaster of a World Series champion when the Marlins won it all in 2003. Dave reached the pinnacle of recognition for a baseball broadcaster in 2011 when he won the Ford Frick Award from the Baseball Hall of Fame, given to a broadcaster each year for “major contributions to baseball.”4 When he found out he had been chosen, the man usually so good in describing situations was at a loss for a bon mot. Anyone visiting Dave at home would notice that the mantle at chez Van Horne bulges under the weight of other awards and honors he has received over the years. In 1996 he won the Jack Graney Award, given by the Canadian Baseball Hall of Fame to a media member who has made a significant contribution to Canadian Baseball through their life’s work. He was given the Sports Media Canada Career Achievement Award in 2012 and was inducted into his high school’s Hall of Fame the same year. He was to be inducted into the Canadian Baseball Hall of Fame in June 2014. If you wanted to describe on Twitter the key to Van Horne’s success, you could use the hashtag #preparation. He starts each day by searching through websites like mlb.com and espn.com for information. He then goes into the heavy prep work by going through everything that’s available to him on baseball-refernce.com to get statistical breakdowns, game splits, pitchers’ and hitters’ records, etc. He won’t recite a stat for its own sake, but he’ll have it available if he needs it. If it’s a home night game, Van Horne drives to the stadium with Hutton at 3:00, talks with the managers, then visits the clubhouse the dugout and the field to see what he can pick up. Overall he spends five hours every day getting ready. And even in his 70s, he showed no sign of slowing down. As of 2014 Van Horne lived in Palm Beach Gardens, Florida, with his wife, Josée, whom he met in Montreal, and their daughter Madison. There are also five sons and 11 grandchildren. Special thanks to Dave Van Horne for generously giving his time. 1 All quotes, unless otherwise noted, are from an in-person interview conducted with Dave Van Horne on February 11, 2014. 2 Vin Scully interview with the Palm Beach Post, (uploaded to YouTube on May 28, 2011). 3 Mandy Housenick, “Dave Van Horne’s passion is in his voice,” The Morning Call (Lehigh Valley, Pennsylvania), January 21, 2013. 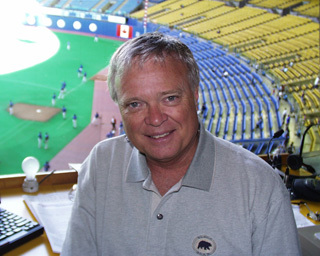 5 Jeremy Sandler, “Former Expos broadcaster Dave Van Horne to enter Baseball Hall of Fame,” National Post, December 8, 2010.